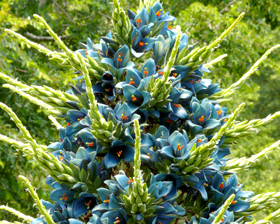 Puya berteroniana, the Blue Puya, is one of the largest genera in the Pineapple Family, Bromeliaceae. 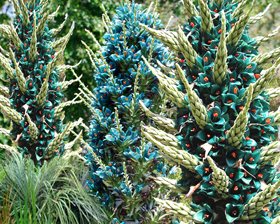 The large flower stalks of this plant rise from the masses of curling, silvery foliage, displaying deep turquoise blue flowers, 5cm in diameter, and in the centre of the flowers, beaming out, are the highly contrasting orange anthers attracting birds, bees and other insects. Large flower stalks are born in spring and summer. Leaves are long, with sharp teeth on their sides. Its beauty is remarkable! Can survive to -7C and does fairly well in hot temperatures as well. They are easily grown outside with no protection in lower zone 8. In colder areas plant in a container. 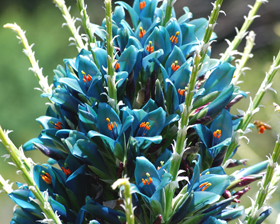 It enjoys very dry, well drained sandy soil. Grow in full sun or part shade. The seed can be directly sown. Procure light and warm temperature and a moist to dry soil. Grow like cactus. Germination is usually fairly quick, 2-4 weeks.